All three countries have certainly discussed ways to coordinate their activities in various respects, focusing on areas like intelligence coordination, and they are set to meet again later this year, either separately or on the sidelines of upcoming regional meetings. But the public formation of a joint task force – conventionally understood to be interagency and/or multinational formations directed at particular operations (in this case terrorism) – would represent quite a dramatic acceleration in subregional cooperation. 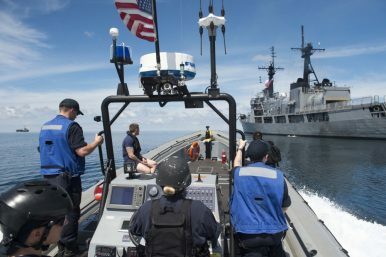 This is particularly the case given the significant obstacles to trilateral counterterrorism cooperation that officials continue to talk about, from differences in organizational culture to bureaucratic rivalries to lingering distrust among the countries, which still have disputes among them (See: “Confronting Threats in the Sulu-Sulawesi Seas: Opportunities and Challenges”). The same could be said about Duterte’s offhand comment regarding opening up Philippine borders to Malaysia and Indonesia. It belies the fact that one of the thorny issues that had to be worked out before the official unveiling of the trilateral maritime patrols was the rules of engagement for the vessels of outside countries, which was not surprising given the remaining sovereignty sensitivities between them. The broader problem here, which is one observers have faced on several other issues as well, is that Duterte does not shy away from carelessly employing inexact language even on sensitive matters that demand exact language or no comment at all. As one Philippine defense official told me early on in the Duterte era, on issues like this one, it may be best to await word from Philippine agencies that know better or wait for an actual agreement to surface between the countries involved, rather than to simply assume that Duterte’s words carry weight in and of themselves with respect to actual policy (See: “Where Are US-Philippine Defense Relations Under Duterte?”). A US-China Role in the New Sulu Sea Trilateral Patrols? The expansion of the indigenous initiative needs to be properly framed. What’s With the New Sulu Sea Trilateral Air Patrols?What’s Next for the Sulu Sea Trilateral Patrols?ASEAN Terrorism Threat in Focus at 2018 Shangri-La DialogueWhat’s Next for the New ASEAN-Australia Defense Meeting?What's Next for the New ASEAN ‘Our Eyes’ Intelligence Initiative?